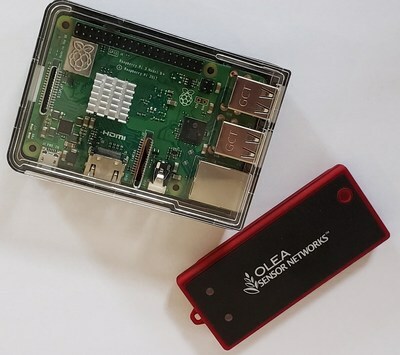 RENO, Nev., /PRNewswire/ -- Olea Sensor Networks, a leader in intelligent sensors and analytic software for sensor network-based systems, announced their next gen OleaSenseTM OS-3010 development platform for IoT applications featuring a new design made compatible with Raspberry Pi as well as all Linux and Android based systems. This powerful low cost development platform, hosting Olea's machine leaning algorithms, is capable of running up to four OS-3010 sensors simultaneously and will enable Olea to serve more developers interested in designing new IoT solutions based upon OleaSense technology. The OS 3010 is a wireless, contact-less device is able to collect and process heart and respiration data with clinical accuracy, extracting vital sign statistics using Olea's intelligent sensor analytics which may be transmitted via Bluetooth to the cloud. No external wires and no direct contact with the body is required. It has as compact design, measuring smaller than a business card and weighing about 1 ounce and may be embedded in or under most materials without adverse effect on function or accuracy. "This latest generation of OleaSenseTM development platforms provides the opportunity for real-time information in monitoring the overall well-being of people. The applications for this system in healthcare and wellness are numerous," explained Frank Morese, Olea CEO and Founder. "We wanted to keep engineering challenges in mind when we endeavored to enhance the capabilities of our existing OleaSenseTM platform with advanced machine learning diagnostics. We are now providing a development platform at a much lower cost than other clinically accurate systems on the market today. Having launched this new development opens up opportunities to create more and better product designs with the end result of potentially less time and money spent by our customers in getting their product to market. We have an established track record of working with market leaders to bring the most advanced technologies to market in record time. This next gen OleaSenseTM platform has just made it possible for more companies interested in developing products with a vital sign monitoring component to realize that goal." Olea Sensor Networks, incorporated in 2011, develops intelligent sensors and analytic software for advanced "Internet of Things" (IoT) service solutions addressing a wide variety of applications such as Connected Care, Connected Car, Smart City and Industrial Safety. Olea specializes in developing non-intrusive sensing technologies and wireless sensor networks including OleaSenseTM, vital sign biometrics technology for advanced safety systems and OleaVisionTM, for Life Presence Detection safety systems. Olea is located in Reno, Nevada. For more information go to www.oleasys.com. Follow us on Twitter @OleaSys. Olea, Olea Sensor Networks, Olea HeartSensor, Olea HeartSignature, OleaSense, OleaVision, BalancedSense, RespiroTrack, IoT Intelligent Partitioning Architecture, OSN Quadcorder, DrowseAlert are trademarks of Olea Systems, Incorporated. Other trademarks (registered or otherwise), names and brands may be claimed as property of Olea Systems, Incorporated or by others.